When I first had the idea for this article it seemed easy. 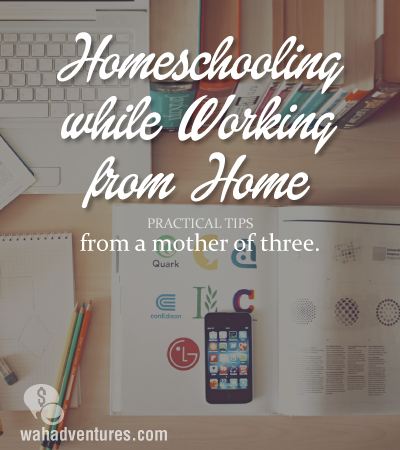 I was going to lay out some nice, pretty bullet points on ways to practically manage working from home and homeschooling. I quickly realized however, that just wouldn’t work. First, it gives the illusion that the task is “nice and pretty” as well as the crazy idea that I actually “manage” it. The fact is, I (we) survive it. Another fact is, it is spectacularly awesome and I wouldn’t have it any other way. I decided I could only let you know some ways that I have found, in the first year, to help it work better in hopes that I can help some of you who are homeschooling or considering homeschooling while working from home. Since this is a work-from-home blog and not a homeschool blog, I am going to focus on how I had to tweak my work day rather than how we run our homeschool. My schedule is extremely flexible as a freelance writer. I can choose how many jobs I have going at any one time, and I can make certain I do not have too many deadlines hitting at once. This allows me to be sure that I do not have to choose between school and work. It is a huge blessing, but I also have to constantly look for work. There is give and there is take. You may not do school in the morning. You may work in the morning and do school in the afternoon. You may work only on the weekends, or you may do school on Saturdays. One of the great things about both homeschooling and working from home is that you do not have to conform to the scheduling norms of our society. If your kids work better in the afternoon, work in the morning and do school before dinner. Here it works best if I work an hour or so before school while the kids eat breakfast and play a little. Then we do school and lunch, and I work some more in the afternoon before dinner. I can also work after they go to bed if need be. Hmmm, work, school, work, dinner, bed…notice there is not much time for housework? When I say clean is relative I mean if you have clean laundry, clean dishes, no food out in the open drawing flies, and you wipe up anything sticky- you may have to be happy with that. Luxuries like a clean bathroom may only happen every other Saturday. I am hoping this gets better, as I do have an 8 month old right now, but seriously, you might have to deal with a little dust if you are going to have money for food and the kids are going to have a decent education. The same goes for yourself. You do still have to shower, but it may be while the kids are eating lunch. Don’t get me wrong, on the days I get in the shower and dressed before we do school- the day goes much better, but I miss all that good quiet time to work while they are sleeping and eating breakfast, so it rarely happens. I take the work time when I can get it. My situation is a little different as my two younger children have a chronic illness that requires close to 4 hours of treatments per day combined. My friend works from home but has to travel a lot selling advertisements to businesses. Her husband works from home as a Social Media expert and insurance salesman, so they tag team teaching whenever they can. Another friend works nights and weekends at a retail store so she can be free to homeschool during weekdays, and still another works full time, so her mother keeps the kids and teaches some subjects. She teaches the rest at nights and on weekends. If you are a homeschooling parent looking to work from home, it is possible. Take some of what I have said, do some praying and thinking, and find a way to make it work for you. If you already work from home and are wanting to homeschool, take a hard look at your job and what it requires, remember that school has to come first, and figure it out. It will not be easy, but if it is something your family is called to do or needs to do for whatever reason, it can most definitely be done. Do you we have any readers that both home school and work from home? We would love to hear what you may have to add! Financial variables truly do make a difference with regards to deciding to self-teach. I have heard a few families assaulted on the grounds that they are as well “egotistical” to make the penances important to self-teach, specifically surrendering mother’s salary. Be that as it may, without knowing the money related circumstance of a family, those are risky presumptions to make. A few families really require two earnings.